Quintessentially British design and exquisite craftsmanship combine with the vintage-inspired Emmy London collection. This magnificent ring is crafted from gleaming 18ct white gold with a breathtaking marquise diamond centrepiece and halo. 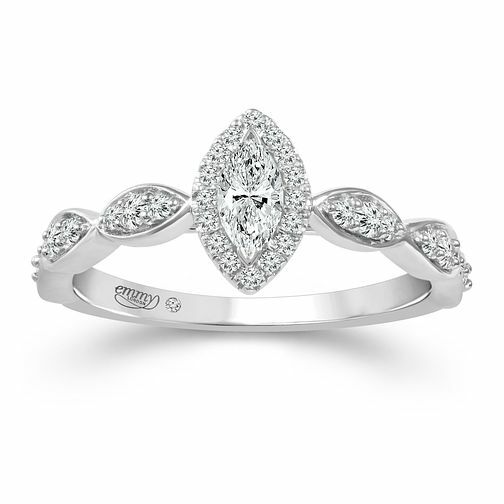 The ring band is beautifully sculpted with marquise frames set with brilliant diamonds. A sleek and sophisticated ring, perfect for conveying your feelings to that special someone. A hidden stone sits within the band, alongside the Emmy London signature. The total diamond weight of this ring is 0.40ct.